Helicopter Charter or hire to the Isle of Wight. Helicopter Charter or hire to the Isle of Wight. Helicopter Charter or hire Isle of Wight. The Isle of Wight is located on the southern coast of the UK accessible by sea ferry travelling 4 miles south from Portsmouth or Southampton off the coast of Hampshire across the an area of water known as the Solent. The island itself is the second largest inhabited island in the united kingdom with a good road infrastructure. The island does not however have a useable airport which can land light aircraft so access to the island by air is restricted to Helicopter Charter. The main towns on the Isle of Wight are Brading, Cowes & East Cowes, Newport, Ryde, Sandown Shanklin, Ventnor and Yarmouth. Helicopter Landing Sites Isle of Wight. Our helicopters have varied landing site locations on the Isle of Wight spanning the entire Island many are private sites that may relate to hotels, The Isle of Wight Festival, Cowes week Yacht racing or simply a private holiday home. We can land our helicopters anywhere there is space enough within the realms of safety and with written permission of the land owner or hotel. There are 2 very small private old airfields on the Isle of Wight, whilst these are not useable for light planes they can be used for Helicopter landing they are Bembridge and Sandown. There are many events of note that take place over the summer season on the Isle of Wight that are easily accessed by Helicopter Charter these include the Isle of Wight festival, The Festival of the Sea and Cowes yacht week. 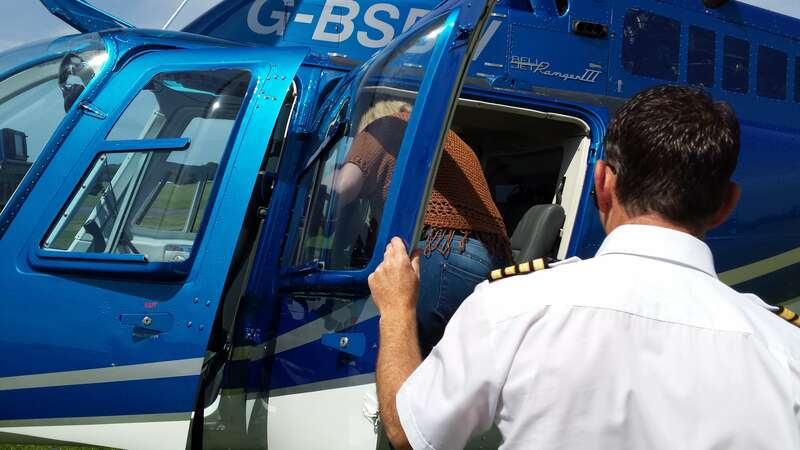 Choose from a fleet of Helicopters that are available across the UK to suit your needs weather you wish to charter a helicopter from London or even Southampton to reach the Isle of Wight we are the UKs prime provider of Helicopter charter. Travelling to the Isle of Wight by helicopter. Travelling to the Isle of Wight by road is lengthy, not least because of the congested ferry crossing which tends to be booked out well in advance during the summer season. If you were travelling by car from London the journey would take you around 2 hours on a good day to Portsmouth or Southampton and then an hour on the ferry assuming that you have booked far enough in advance. In contrast to this when you charter a helicopter to fly to the Isle of Wight from London it takes around 30 minutes and you get to see this jewel of an island from the air on the way to your landing site.